Finally warmed up outside again, so set up to go for a drive in my 74. Turned key on, fuel pump started, turned key further to start engine, got a brief click, then total silence. No pump, then tried lights, nothing electrical works at all. Battery checked and is good, fuses look good, wiring seems unchanged from good condition. After a few minutes, lights were available again; so turned key, all died again. This happened twice more; now nothing at all. Took off air cleaner; all looks well at starter. Any ideas? Remove, clean, & resecure all battery -> starter circuit connections - both battery cables, the ground cable's connection to the body and the positive cable's connection at the starter motor (do that one with the battery disconnected). Do not assume these connections are OK because they look good and feel tight. Make the effort to ensure they are all 100%. I think Eric is right on...Had a similar problem and it was the battery to starter connection, the cause for the problem turned out to be bad motor mounts which allowed the engine to sag and stress the cable. Forgot to add - there is usually a ground strap between the engine or bellhousing and the body (chassis). Its connections have to be 100%, too. That happened to me at the toll booth to the San Francisco-Oakland Bay Bridge. Paid my toll, stepped on the gas and then *dead*. The battery cable end broke off the starter, breaking the circuit and killing all power. I figured this out after the tow home. Appreciate the suggestions; thanks! Disconnected the battery; cleaned connections at the starter; with a long jumper wire, tested the connecting wire to the battery, which had continuity, very little resistance, and no connection to ground; cleaned the battery terminals; started tightening the positive terminal, which revealed that it was cracked. The picture may not show it clearly. Will take the RX7 support vehicle out to get another whenever it stops raining. Will post again if this is not the problem source. Sorry to revive an old thread, but looking for some clues from any of the electrical gurus out there. 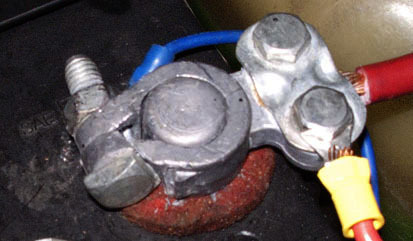 3) Turn key to first position, all of the electricals work. 4) Turn key to start car. It doesn't even start to turn over but everything just goes dead. Further attempts at going back to first key position yields no power. Here's the weird thing: if I disconnect and then reconnect the battery, then the accessories start to work in the first key position again. So it's not a fuse. Question: what would get "reset" by disconnecting and then reconnecting the battery that would lead to this behavior? It doesn't make sense to me. Any tips appreciated... I want to get her on the road! Sounds like an ignition switch problem. Pull one of the wires from the starter relay and see what happens when you repeat the procedure. I had similar issues, even after cleaning connections, etc. It turned out to be corrosion on the ground wire underneath the clamp itself. I was able to cut off and re-strip the wire as a temporary fix and then sourced a new ground cable, I think from Amazon. I ended up sanding the connector at the negative battery terminal as there was some corrosion, and it started right up. It's all very strange - I still can't figure out why it wouldn't give any sign of life unless I disconnected and then reconnected the battery. It's like there's a relay that's stuck in one position until the battery is physically disconnected, but that also doesn't make sense. But it's running now, so I guess all good. Thanks for the suggestions. My best guess is that with corrosion on the wires under theconnector, the actual contact area is pretty minimal. Enough to flow a few amps when you turn the key on but when you try and start it the big hit of juice it sort of instantly oxidizes the small number of wire strands actually in contact with the connector, thereby breaking the ground. Actually, that is quite common. When the cable connection is iffy, it can pass the small amount of electrons that flow when the key is first turned to 'on' but then fails completely when you try to run the starter motor (huge amount of electrons needed). Removing and reinstalling the cable gave it a little bit of cleaning. Just to emphasize, my issue was with the end of the ground cable that gets clamped into the cable terminal. I pulled my hair out for a week chasing this, finally disassembled the cable terminals and found heavy corrosion on the cable end wire itself.